How to Integrate Kartrocket with Shiprocket? Kartrocket is India’s most popular website building platform and e-commerce solutions provider for small and medium enterprises. Given below are the three main synchronizations which you receive when you connect eBay with your Shiprocket account. Automatic Status Sync – For the eBay orders that are processed via Shiprocket panel, the status will automatically be updated on eBay channel. Catalog & inventory Sync – All the active products on eBay panel will automatically be fetched into the system, where you can manage your inventory. 1 Login to Kartrocket admin panel. 2. 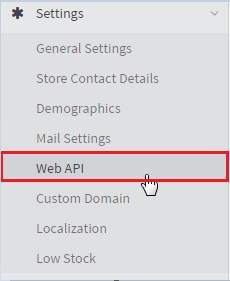 Go to Settings Tab -> Click “Web API”. 3. In Web API -> “Key” field fill in “API” and click on Save button. 4. Click on Kartrocket -> Integrate. 6. Fill in the Parameters i.e Store Url and API key as saved from the Kartrocket Panel. 8. Green icon on Channel Page indicates that the channel has been successfully configured.